There’s nothing quite as wonderful as JRPGs’ common practice of utilizing sweeping compositions to accompany equally vast journeys. Trails of Cold Steel is not much different. But what’s even more striking about the latest installment in The Legend of Heroes’ series, is when its soundtrack deviates from this norm. The surprise 2015 end of year release in The Legend of Heroes series is no slouch in its in-depth characterizations and political intrigue. Just like its Kingdom of Liberl counterpart in Trails in the Sky SC, the soundtrack to the Erebonian conflicts and student life in Trails of Cold Steel is worthy of praise. There are a couple of things which stand out about Cold Steel—both attributable to its narrative—which are then reflected in its soundtrack. The first is its story of a heavily militarized empire rife with internal conflicts and class distinctions. These struggles manifest during an age of discovery and developing the newest technology in a rapidly evolving industrial revolution. This setting is the basis for an intriguing exploration of technological advancements which are then balanced with more traditional elements to JRPGs in its monsters, mysticism and lore, alongside an ancient civilization with bizarre, unknown technology of its own. In the early morning, quiet nights begin to give way to stirring daylight. The peaceful atmosphere still hangs over Thors Academy and Trista, its attached host town filled with cozy shops. It’s all here in that track: Class VII’s isn’t quite ready to go, while it gently eases the rest of the town into its day’s activities. When this plays, it’s usually right before Class VII heads out of town, taking an early morning train to a far away location in the Empire, with various tasks lying ahead. The tasks are varied in Cold Steel, from monster extermination to book deliveries. The game draws from the established Bracer Guild prominent in the great (and often adorable) Trails in the Sky series, a group of people with specialized combat abilities who work to serve and protect regions’ civilians. It’s why a lot of these activities may feel mundane at times and structured, but there’s a real story connection here at various places, and instances which I wouldn’t want to spoil. Despite this element, Cold Steel and Thors Academy have roots based in the hard, iron-fists of the military which is evident in the style of certain tracks. One of the central points established in Cold Steel are the conflicts, with Erebonia placing its sights on the neighbouring Crossbell. There’s always this underlying tension as the Empire flexes it might in the form of two huge railway guns, as a way to threaten enemy approaches to its borders, while trained on Crossbell with the capability of decimating the state and its people. High culture class structures form an important role in Cold Steel’s narrative, as feuding nobility wrestle for control of lands and political favor. As such, there are pieces which convey those sounds too. But that’s one area where the game can lead an expected sound astray. The piece that plays in Heimdallr confuses me when I hear it. The city is affluent, home to a center for Opera, a glass sanctuary garden and the Empire’s Crown Prince and Royal family. But there’s something about the music that plays as you navigate Heimdallr’s historical streets that aren’t quite in tune with what I associate what its portrayal should sound like. 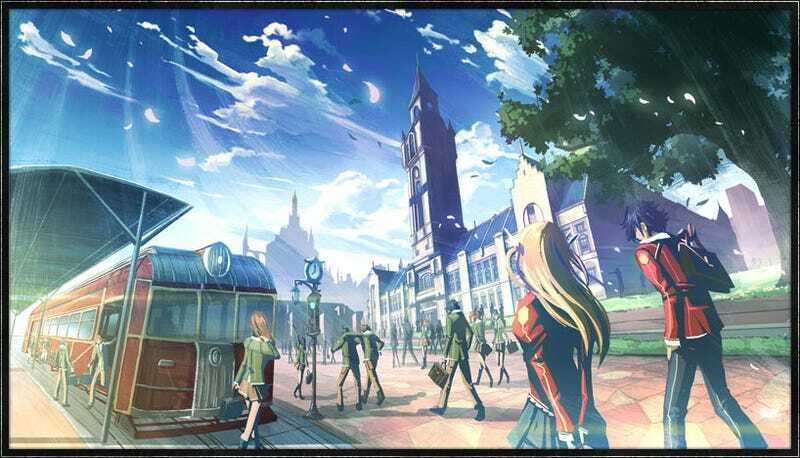 There’s also blending of the city’s adaptation of the new technology which is a heavy aspect of Cold Steel’s narrative. It’s not quite leaving the past ideals of nobility behind, but it is an evolving piece which is settling into the comforts and discovery of what the industrial revolution has brought and will bring. It’s a piece that’s all of those scenarios—its noble roots, its evolution and its excitement of a festival. This particular piece plays during exploration of an old schoolhouse which holds many secrets, and is basically an activity in dungeon crawling. The theme doesn’t quite fit the action for the drab locations and the act itself, but plays to the knowledge that the schoolhouse itself is likely a relic designed by the ancient civilization. The other part to Cold Steel’s story to explain some of the roaring rock-infused battle songs, is aligned with the technological aspect of the world building. It’s a fun excuse, and a little nod. Of course, the cast doesn’t hear all of this soundtrack music throughout the game, and it’s there for our benefit as players. Games like Final Fantasy VII do have rock tracks with electric guitars to amp the intensity of a fight, such as with its boss music. So in that sense, Cold Steel doesn’t do anything new but it’s interesting that the writing slips in the fact that “rock” music is something that’s an upcoming style, making waves and relatively unknown in their world built on traditions and class structure, in which operas are the accepted form of music and represents high class culture. It’s just one more way in which Cold Steel shows the cultural divide, and the steps towards erasing it. This isn’t a wholly original idea after all, as it mirrors some of our real world’s own musical history but it’s hilariously implemented all the same, when thinking of it in those terms. It’s also a little jarring hearing these heavy guitar riffs which cuts a lot of the whatever lulls and classical environmental music which may have been playing before you happen upon an enemy, as many of the tracks are used as battle themes. The rock tracks though, aren’t all clear cut distinctions. They still use violins along with the the guitars, but hey, who said violins cannot be rock? Like any good soundtrack, a number of these pieces get the job done to motivate players for battle. I may not love a lot of the rock-based pieces but I changed my mind on at least one of them after finishing the game. Trails of Cold Steel blends all of these distinct songs in a way that’s completely odd. There’s so much going on that can be derived from its many stories, and all the elements this game touches on. It may not seem that way at all, but after spending a compelling 80 hours in its world, its music is quite an understated achievement.